Paul Verhaegh started his career at VVV Venlo before joining the youth academy of PSV Eindhoven. 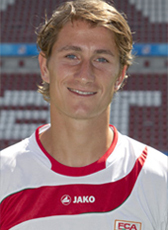 Season 2003-04 he played a loan period at AGOVV Apeldoorn before finally leaving PSV on a free transfer in summer 2004. Two succesful seasons later, he joined Vitesse Arnhem in the Eredivisie. Verhaegh went abroad in May 2010, signing a 2-year contract for German 2.Bundesliga club FC Augsburg. The club was coached by Dutchman Jos Luhukay. After promotion to the Bundesliga in June 2011, the club with Verhaegh as captain managed not to relegate at the end of the 2011-12 season. Verhaegh already signed a season extension in December 2011 until June 2013. In March 2013, the captain extended again. In August 2017, he has left Augsburg and moved to Wolfsburg. The German club signed the defender on a 2-year deal with a 1,5ME transfer fee. The former Holland U21 international, made his senior debut finally in August 2013 featuring in the friendly against Portugal. He was also part of the Dutch Worldcup 2014 selection and played in the match against Mexico.